You: So excited for this remodel! Cannot wait! Also You: How is this going to turn out? Did I make the right choices? What did I get myself into? Life is full of twists and turns. 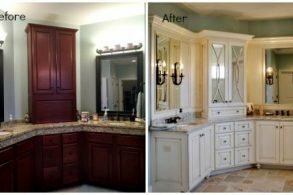 A major kitchen and bathroom remodel? That’s a next level physics-defying-loop-de-loop, stomach-churning-drop, emotional rollercoaster. When you are undertaking an extensive kitchen or bathroom remodel, it is important to know what to expect — both in terms of the process and the emotions you can expect to experience during your project. The possibilities! The potential! The power to transform your house into your dream home, one room at a time! 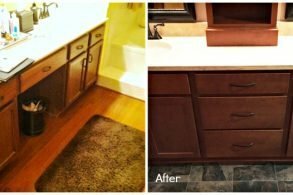 A remodel is exciting: everything from scouring showrooms and Pinterest for inspiration to working with your contractor to nail down the details on your design is a “high” on the remodel rollercoaster. Most people experience a little dip after the design phase, but spirits quickly rebound when you review working drawings and designs. You really begin to see your updated, upgraded, up-styled kitchen and/or bathroom take shape. Best. Idea. Ever. Give yourself a pat on the back. You got this. It’s about to get interesting. Putting your work out to bid often causes a drop in excitement — and a corresponding increase in anxiety. Nothing’s happening yet. You may be worried about cost overruns, wondering if you’ve made the right decisions, concerned that your vision is blurry! But then bids come in. Contracts are signed. Work gets started. Finally! It’s happening, and you’re climbing once more. Through demolition and rough framing, the forward momentum carries you to another peak. What goes up must come down? Well, not always… but, in this case, yes! Why Are You In My House?! Reality sets in. In the morning, you love to make yourself a cup of strong coffee and sit at the kitchen table, enjoying some quiet moments to yourself. And your contractor. And the crew. And tools. And protective plastic sheeting. And no sink. No matter how conscientious the contractor or courteous the crew, there is a sense of intrusion. You home is being invaded. Ripped open and apart. You also have to change or tweak your routine, which can be unsettling and stressful. After the buzz of seeing a wall framed up here or another knocked down there, work appears to slow. Drywall. Sanding. Electrical wiring. Plumbing. Just get these people out of my house! It can be frustrating when the “dirty” work is being done because it often feels like nothing is being done. In reality, mud is drying, cement is curing, your contractor’s communicating with inspectors… it may be happening “behind the scenes” but it is happening. At this stage, nerves can fray. There’s a “mess” (though your contractor will keep a tidy worksite, you will definitely know he or she is there!). There’s a loss of privacy. There’s a feeling that this all just needs to be done so you can go back to normal. How can you keep your cool during a remodel? Accept that you will feel some stress. It’s going to happen. Working with the right contractor will make sure it happens much less, but you can expect some mixed emotions. These feelings are a normal part of the process, and you can manage them with healthy habits. Just getting out for a walk can help enormously. Communicate! Keep in touch with your contractor. Ask about progress. Relay any concerns. Check in on the schedule so you know what’s happening, when. The more you know, the less you stress. It’s being kept in the dark (not literally; your electrician turned the power back on!) that can be difficult. Stick to your routine as much as possible. You may have to enjoy your coffee in another room or go to a coffee shop. You may have to skip your evening soak and take a shower in the guest bathroom. Make small changes that allow you to still do what you do. It won’t last forever. Keep the end goal in mind. When the going gets tough, go back to your drawings. Go back to your vision. It will be realized. It will be done. You will enjoy the kitchen or bathroom you’ve always wanted. Really! 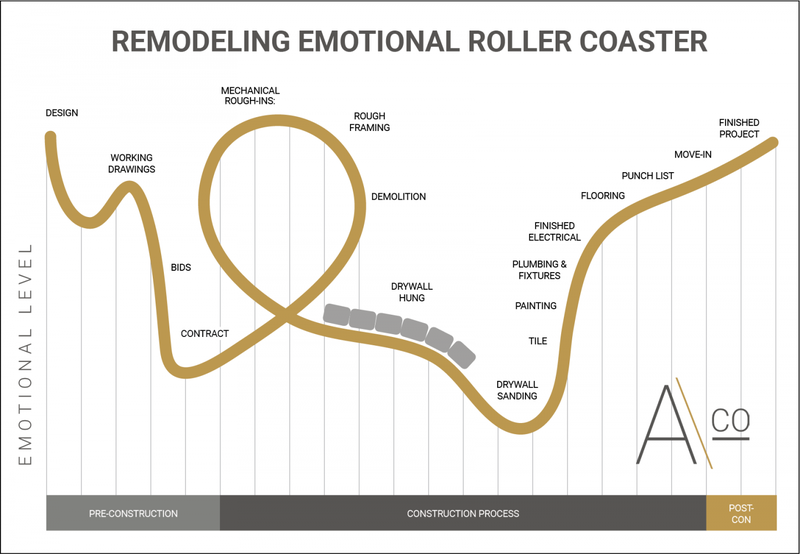 A kitchen or bathroom remodel can be an emotional rollercoaster. Why not buckle in and enjoy the ride! We’ll guide you through every step of the process, ensuring you feel far more excitement and fun than unease and anxiety. Schedule a free in-home consultation and let us help you love where you live.